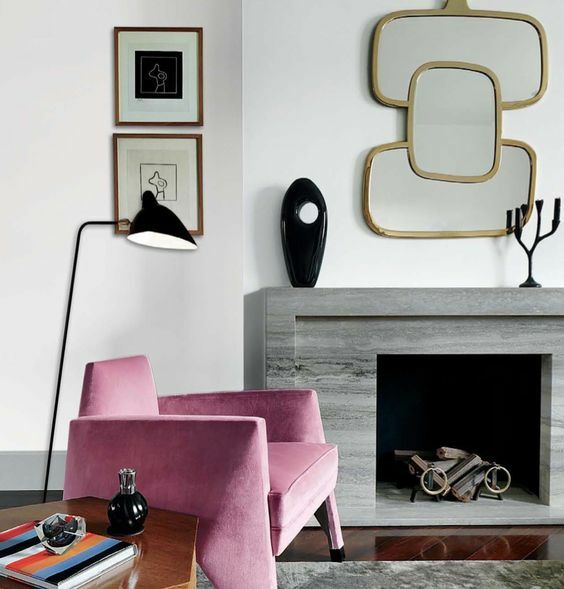 Continuing with our series of sophisticated color combinations, this week with the incredible break in the weather, I was inspired to look closer at the color pink and blush tones of pink. With pink being such a fashionable color in women’s clothing (and men, if you include Gucci!) we are bound to see more in interiors. Ahead are a few examples of winning combinations using pink. 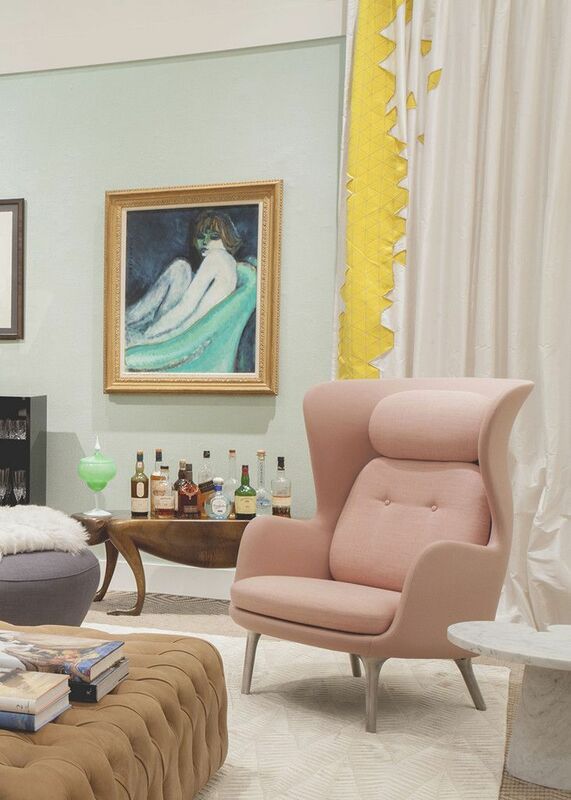 This is a very feminine and almost subtle color selection in a whimsical room. 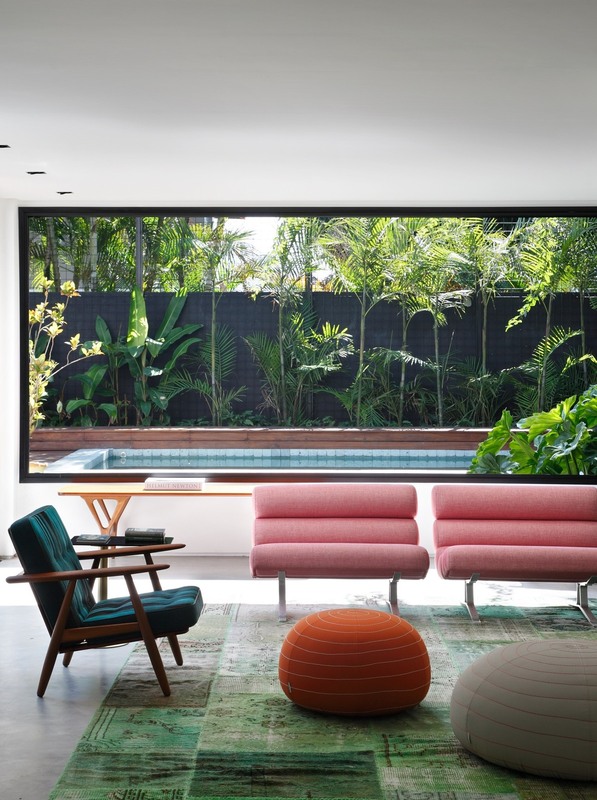 We love the combination of the pink chair with a bold yellow curtain detail, a purple ottoman and minty green walls. A playfully sophisticated combination of pink retro chairs, teal, a burnt orange pouf and hues of green in the rug take this minimal room to the max! 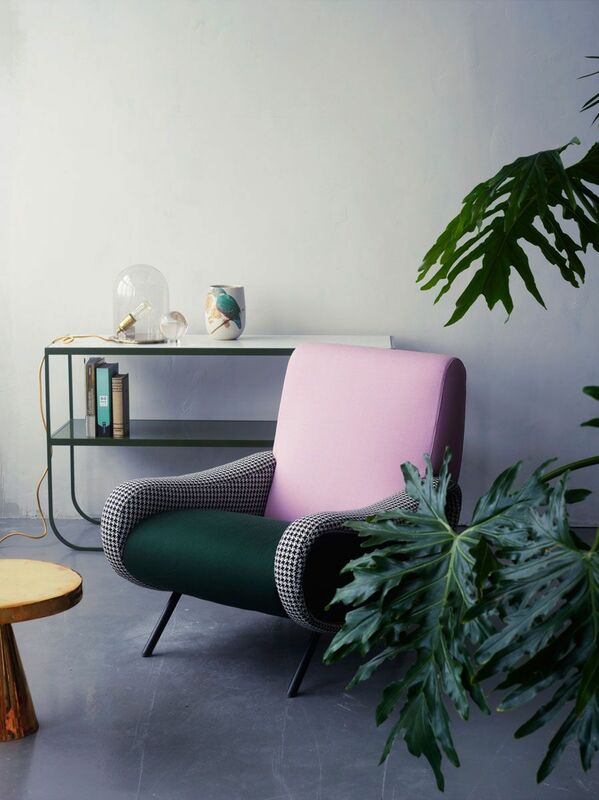 I love this fresh ‘kitsch’ approach to the old pink and green color combination. Using a dark forest green with the houndstooth makes this whimsical statement chair really fun! A playfully pink room for the Visual Therapy whimsical style types. A great color combination reviving the sage green walls with a sputnik inspired starburst chandelier. And, If you’re still not feeling like adding pink to your life, I have also taken the liberty of giving you a few combos including green and gold below. 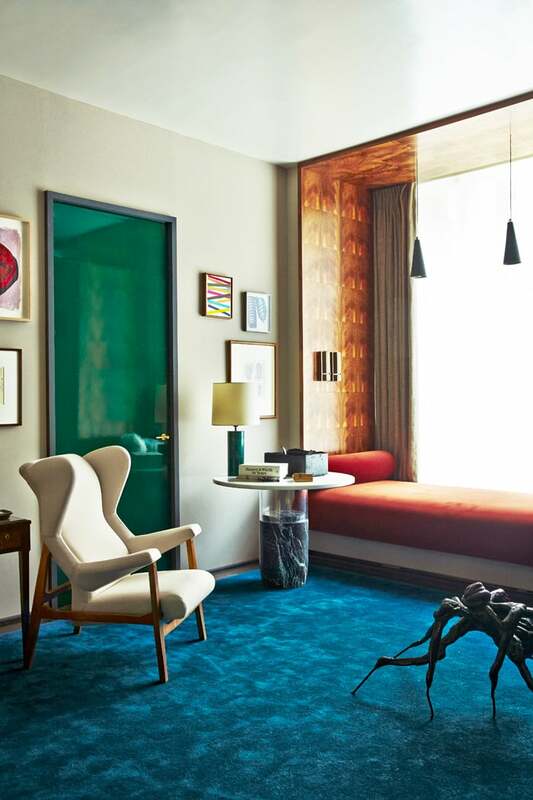 Go bold with highly contrasting hues of blue, emerald, burnt orange and warm sage. This very sophisticated study in green with pops of gold and the purple rug is an unexpected combo for some, but a winner nonetheless. The palette was chosen from the antique chinoiserie screen. Bright emerald green dining chairs with a warm gold ceiling make an otherwise minimal scheme quite extraordinary. 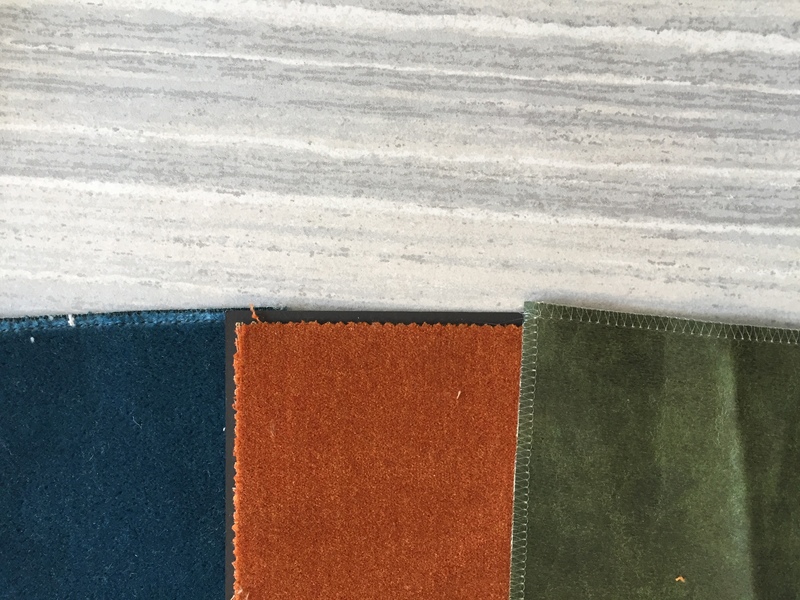 If you’re stuck and need some color combo inspirations, look to wall coverings and textiles for help. 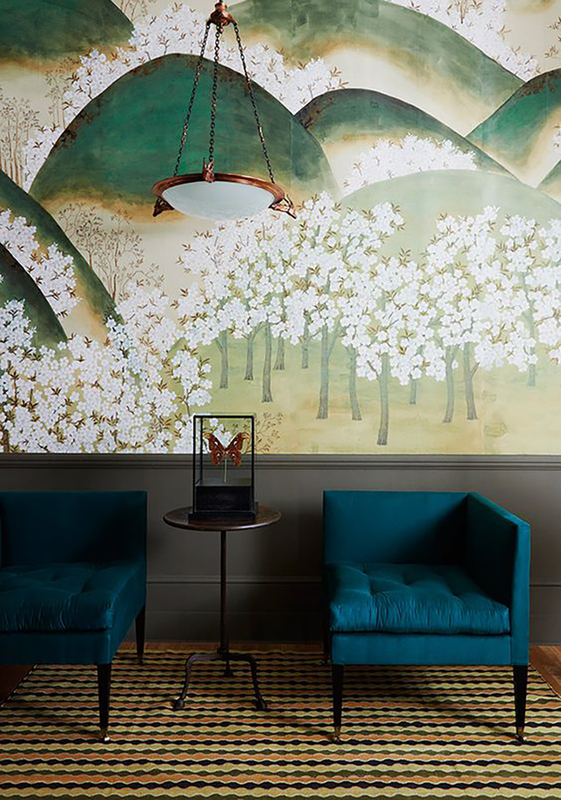 This Asian collection of wallpaper from de Gournay inspired the blue, gold, and greens in the rug. It may seem like a no brainer, but pulling a pop of color from a favorite piece of art is a great guide. This warm combination of yellow, gold and browns has a certain kind of retro freshness. Bold gold paired with deep purple is a beautiful combination in this room. 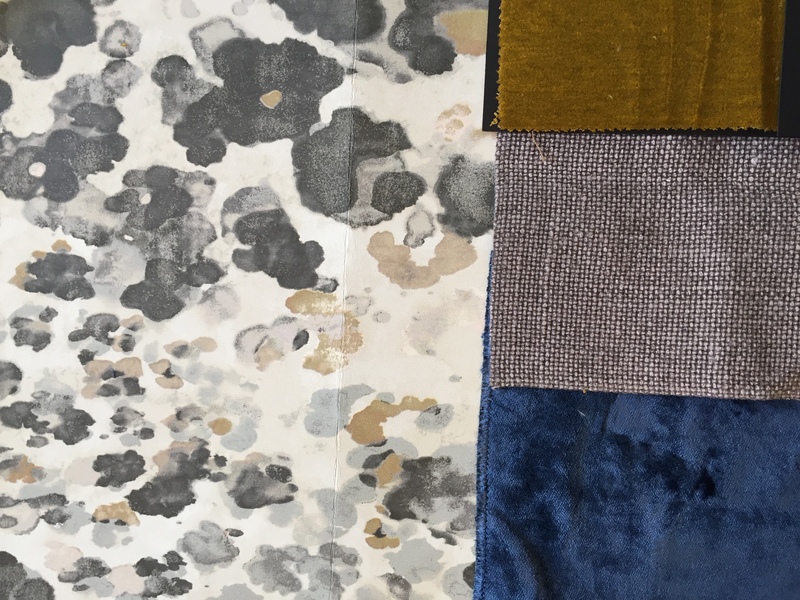 Finally, here are some clever color combinations using textiles that I have carefully selected for client presentations. 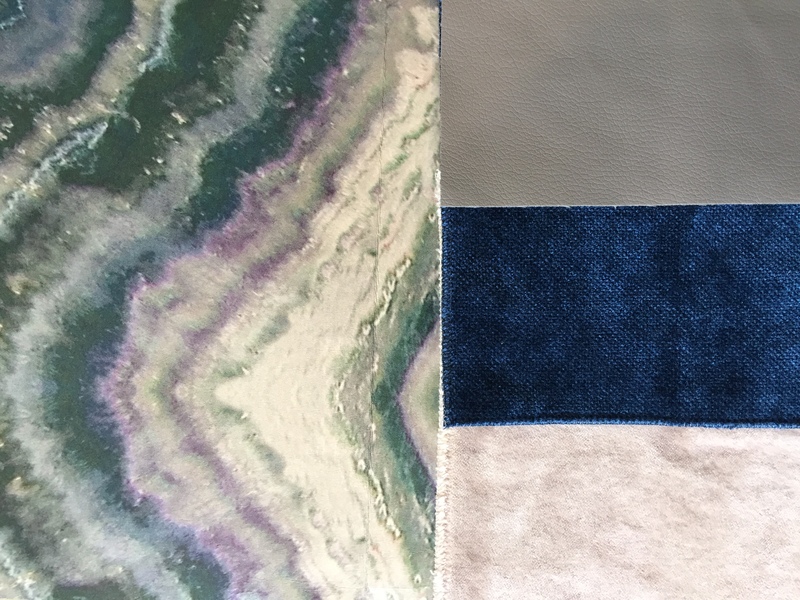 A fantastic zinc textiles agate inspired wall covering is perfect with Romo Groups Musa Rosa Quartz viscose velvet, curve indigo and laser pebble faux leather from Kirby. Romo wall covering with Fortuni mohair and Kirby green leather. Romo black edition Niumi stone wall covering with yellow lentil Fortuni fabric and Kirby curve indigo blue.